Home / 2017 NASCAR season / Logan Stewart / Rookie Stripe / Rookie Stripe: Who makes up the race day team? Rookie Stripe: Who makes up the race day team? 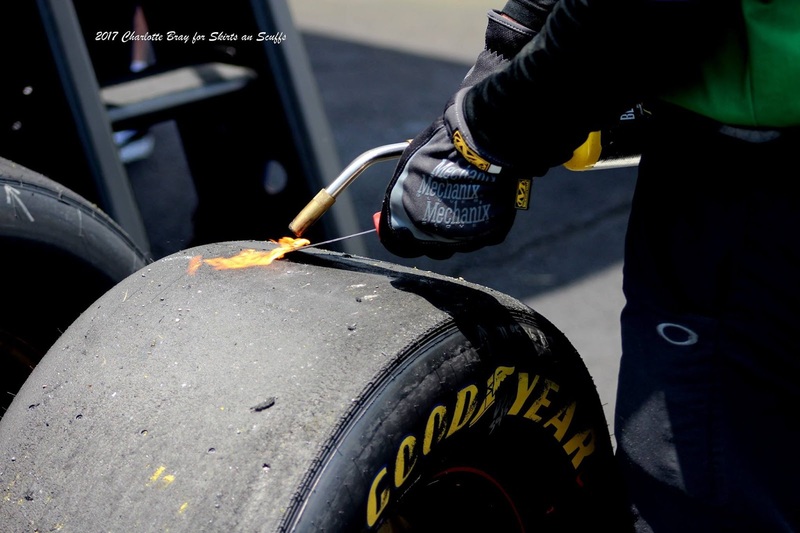 The operation of a NASCAR race day team can be kind of like a commercial kitchen … hurried, demanding and hot. The right blend of people is only the start to helping a car and driver perform each weekend. Let’s be honest, no one likes too many cooks in the kitchen, right? Each person on a race team has a very specific role, and errors can be a recipe for disaster. Members of a race day team have to not only do their jobs well, but also work well together. Crew chief – The crew chief is a race team’s commander-in-chief and in many ways like the coach of a team. Typically a crew chief has years of experience in racing and knows his tracks, his team and tricks of the trade in exquisite detail. The crew chief makes all decisions, including how cars are built and adjusted and which pit crew members will go over the wall. He is the leader and director, frequently telling the driver what to do. Think of him as the head chef. Car chief – To understand the role of the car chief, consider baseball. There’s the coach, which in NASCAR is the crew chief, and there is the third base coach, which in NASCAR is the car chief. Responsible for overseeing much of what happens with the road crew and in the garage at the track, the car chief is also the primary person directing the set-up of the car. During the race, the car chief coordinates between the pit crew and crew chief as needed. You could also say that the car chief’s job is the equivalent of the sous chef in a kitchen. Let that one marinate. Road crew – No dish is superior without lots of flavor. Each driver has a road crew that provides support to the teams and travels to every race. The head of the road crew is the crew chief. They’re a miscellaneous bunch with roles that may include engine specialist, engine builder, spotter, engine tuner, shock specialist, tire specialist, engineer, mechanic and fuel runner. Truck drivers are also a part of the road crew, transporting team haulers from race to race, often on the road for weeks at a time. Pit crew – The over-the-wall pit crew consists of a team of six. They include the gas man, front and rear tire changers, front and rear tire carriers, and a jack man. 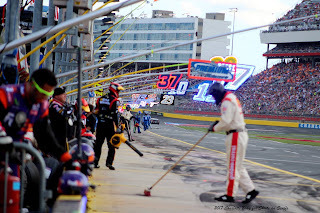 There is a seventh pit crew member who can go over the wall to where the car is on pit road during a pit stop, but his job is specific: he can only remove a windshield tearoff, and give the driver water or anything else he or she may need. (Side note: Cars have have tearable windshields that can simply be stripped off to the next layer when they get dirty with rubber and bugs.) The seventh crew member also takes care of seat adjustments and the driver’s helmet, as well as the interior of car pre-race. Pit support – Pit support are also members of the pit crew, but don’t go over the wall onto pit road during a pit stop. Their jobs are varied but essential, including getting tires before the race, cleaning them during the race and discarding the tires to Goodyear at the track. You can’t make a pancake without a spatula, right? 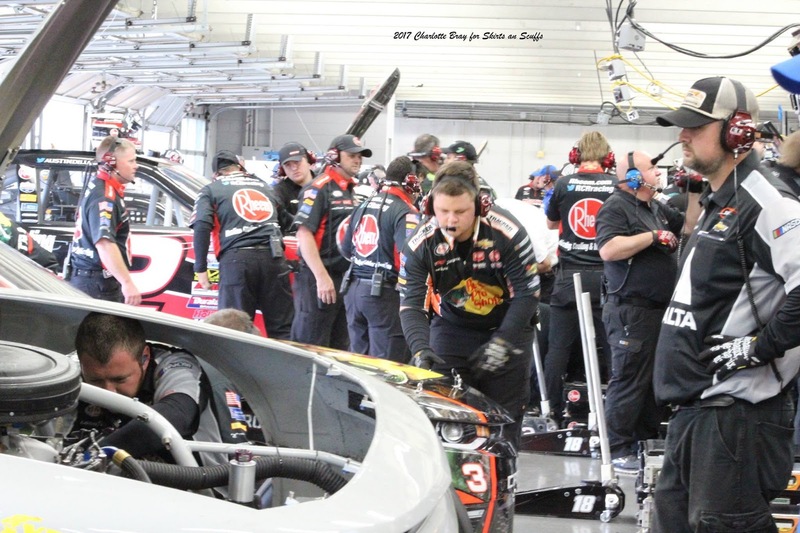 Pit coaches – Just as their title would suggest, pit coaches practice with the pit crew and coach them to help them improve. Just like any other sport, they run different plays such as how many tires to change, adjustments to the car, and fueling. Pit coaches put together the appropriate personnel on the car and the six men or women over the wall, with input from the crew chief. If a pit crew member is injured, the coach figures out who to plug in as a replacement in a pinch. 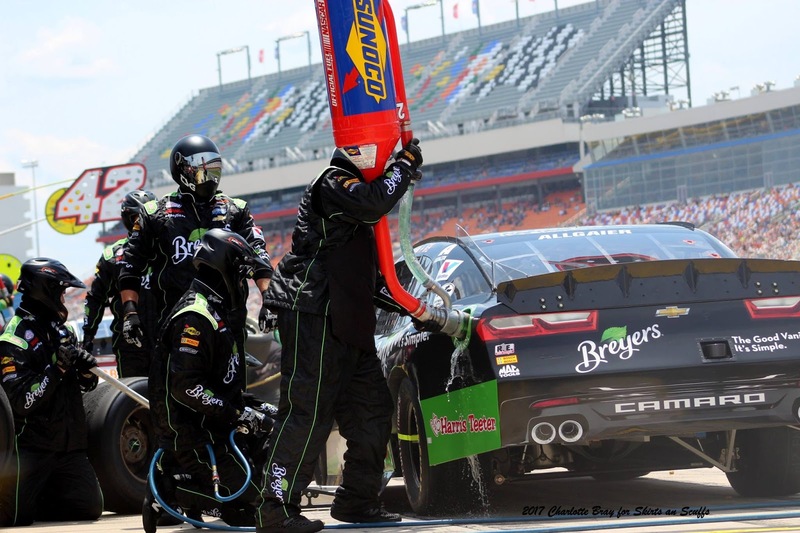 Medical personnel – As racing has gotten more competitive and cars have gotten faster, teams often recruit pit crew personnel from college and professional sports. (Fun fact: NASCAR teams host combines to evaluate potential pit crew, just as a sports team would look at potential players). A higher level of human performance means injuries are always on the forefront and medical care is critical. Some teams have their own physical therapists, athletic trainers or strength coaches who travel with the team on weekends. If they don't have these roles on staff, they may contract local medical orthopedic groups to provide this care. In summary, NASCAR race day teams are made up of everyone but the kitchen sink, sometimes with a scoop of victory for dessert.